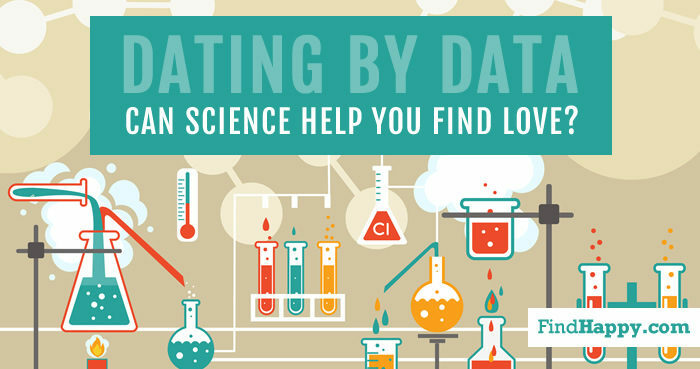 Home› Blog› Advice› Dating by data – can science help you find love? There has been much debate over the effectiveness of online dating algorithms. Many of the leading online dating websites use some kind of algorithm or mathematical formula in an attempt to find you the perfect match but do they actually work or is it just a clever marketing ploy? Today Find Happy takes a look at the science behind compatibility in an attempt to debunk some of the myths and share some science-backed advice on giving yourself the best possible chance of finding love. With the global online dating industry worth an estimated $2 billion per year, with over 91 million users of online dating websites and apps, the market is highly competitive and dating companies/brands will do all they can do convince you their site is the one to find you love. But just how do these computer predictions work, and are they effective? The most common system used by websites is the ‘scored questionnaire’. This simply uses your responses to a variety of questions to match you with other members. More advanced matching systems add a ‘weight’ factor to these answers which adds how important some questions are to the formula in an attempt to generate more accurate matches. Other sites and apps employ a more physiological approach with bespoke algorithms based on your responses to questions and input from relationship experts and psychologists while some use ‘recommendation engines’ much like online stores such as Amazon to tailor your results based on your personal search history. Meta dating – the next frontier? A recent experiment by a team at Newcastle University took matching algorithms a step further, by inviting single volunteers to a speed-dating event in which they were asked to complete questionnaires and compile data based on everyday activities. Some mapped out their eating habits in the form of pie charts while another charted his Fitbit steps. This was part of a larger data gathering exercise to see if they could more accurately match users by profiling many different aspects of their daily lives. Whilst the experiment yielded very few surprises, it opened up the idea of eventually matching people using ‘big data’ gathered by our increasingly connected lives. To date, no online dating company has published any credible evidence that their specific algorithm works. There have been studies which appear to show there is often a placebo effect when a couple are told they are compatible prior to their date when compared to people who have been told they are not compatible. This is a surprisingly important when potential matches view your profile, whether consciously or not. Studies show that people are more attracted to users whose username begins with a letter in the first half of the alphabet. Men are drawn to women with usernames that suggest attractiveness, whilst women find names that indicate success and strength more attractive. Unsurprisingly, names that include anything negative are a turn off for both men and women. Research shows that ‘likeable’ is the most common term used when people describe what attracts them to a certain person on a dating site. In order to appear likeable, you need to smile more. This sounds simple really but few of us rarely get this right. The most attractive pose based on research is with sides of the mouth raised but not grinning like a Cheshire Cat! According to a scientific study conducted by researchers at Queen Mary University of London, your online dating profile should not be limited to just selfies or carefully cropped images, but also feature group photos showing others enjoying your company which help to convey your friendliness and social importance. Interestingly, women find a man more attractive when they see other women smiling at him. We asked our friend Saskia from the award-winning dating profile photography company ‘Hey Saturday’ for her advice on dating profile photography. You can read her complete guide here. Nothing is guaranteed to strike fear into a person more than the dreaded words “say something about yourself”. Fortunately lots of research has been done on how people describe themselves. A common mistake is to try to make yourself sound clever by using complex language. Nobody likes a smart-arse. Research suggests that people are naturally drawn to words that are easy to remember and pronounce, and information that is easy to process increases likeability. Be witty and relaxed when you write your profile and let the reader decide if they think you are funny. Saying you are funny without demonstrating it is a big turn off, especially for women.